In large bowl, dissolve yeast in warm water. Stir in half of the flour, the salt, sugar and 1 teaspoon oil. Stir in enough of the remaining flour to make dough easy to handle. Place dough on lightly floured surface. Knead about 10 minutes or until smooth and springy. Grease large bowl with shortening. Place dough in bowl, turning dough to grease all sides. Cover, let rise in warm place 20 minutes. Gently push fist into dough to deflate. Cover; refrigerate at least 2 hours but no longer than 48 hours. (If dough should double in size during refrigeration, gently push fist into dough to deflate. Move oven rack to lowest position. Heat oven to 425°F. Grease cookie sheet or 12-inch pizza pan with oil. Sprinkle with cornmeal. Pat dough into 12-inch round on cookie sheet or pat in pizza pan using floured fingers. Press dough from center to edge so edge is slightly thicker than center. Cut cheese into 1/4-inch slices. Place cheese on dough to within 1/2 inch of edge. Arrange tomatoes on cheese. Sprinkle with salt, pepper, 2 tablespoons of the basil, the oregano and capers. Drizzle with 1 tablespoon oil. Bake about 20 minutes or until crust is golden brown and cheese is melted. Sprinkle with remaining 2 tablespoons basil. 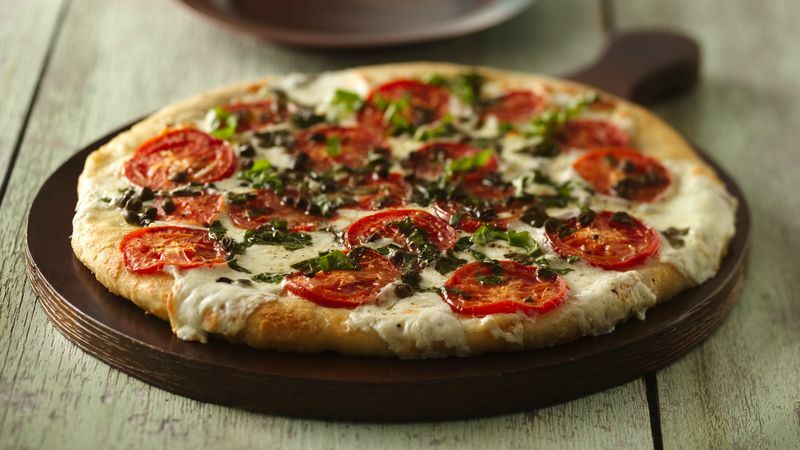 Substitute 2 cups shredded mozzarella cheese (8 oz) for the fresh mozzarella. Sprinkle 1 cup of the cheese over dough. Add remaining ingredients as directed—except sprinkle with remaining 1 cup cheese before drizzling with oil. Fresh mozzarella is very different from the familiar blocks of mozzarella or shredded mozzarella. The fresh version is usually made with whole milk, is white colored and has a delicate, sweet, milky flavor and much softer texture. Some cheese shops, delis and large supermarkets may carry an Italian import called “buffalo mozzarella,” which is made with water buffalo milk or a combination of cow’s and water buffalo milk. Fresh mozzarella is packed in water or whey and is often formed into balls or slices.